In 1988 the National Recreation & Parks Association had a contest. The contest was, “What is the best program for children in the United States of America?” Our Summer Theater Camp was submitted into the contest and won the top honors in the state of New Jersey; then we won the Eastern States' top award, and eventually went on to win the Dorothy Mullen Arts and Humanities Award for “Best Program for Children in the United States of America.” After winning this prestigious award, our company received many calls from school administrators, PTAs, PTOs and Home School Associations asking us to bring our program to their students. 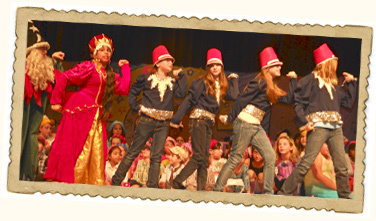 Thus we created THEATERWEEK – a Theatrical program designed to build kid's self-esteem and confidence! 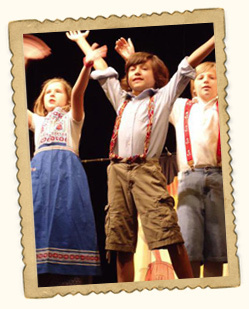 Taubenslag Productions is now available to come to your school and produce an elaborate full-scale musical production in just five days starring your students. Roles are provided for all who want to participate – whether there are 30 kids or 200 – no child is ever turned away. The actors rehearse after school Monday through Friday for two hours each day, and present their fully-staged musical production Friday evening to the entire community. 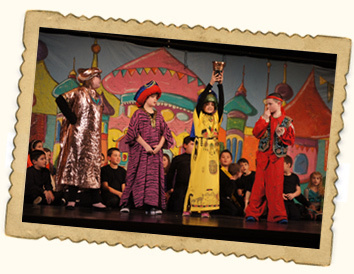 As the curtain opens, parents, family and friends are delighted to see the children's colorful costumes, the elaborate scenery, and the array of smiles. 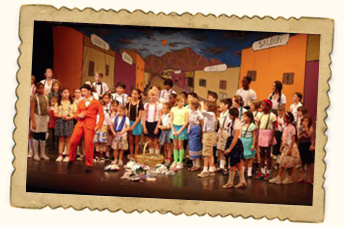 Click here to see photos and costumes from some of our THEATERWEEK shows. “When you try your best – you can do anything”. No scripts are ever used. Every word the children say is what we tell them to say – and if they forget their line – it’s okay to make up a new one! As the week progresses, the children realize when they do try their best, they can really accomplish anything. 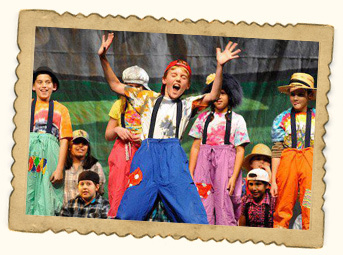 For many children, THEATERWEEK is their first chance to shine and succeed in front of their family, friends and peers. While THEATERWEEK has been provided by some schools as a cultural enrichment program it can also be an excellent fundraiser. 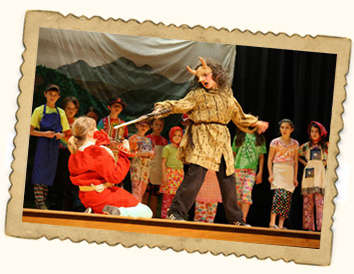 Many PTAs, PTOs and HSAs have raised a considerable amount of money by selling tickets, flowers, tee shirts, refreshments and boosters in the Playbill. The possibilities are endless! 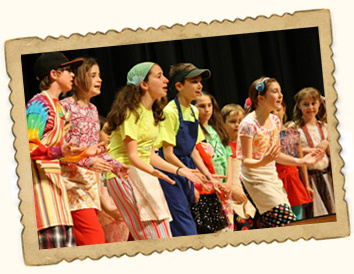 Since winning the prestigious award in 1988; our original THEATERWEEK program has been presented in schools throughout the United States with more than 100,000 children performing. 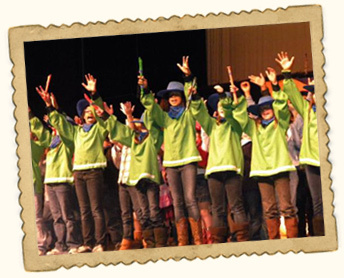 Participating students have gained experience, knowledge and a greater appreciation for the performing arts. 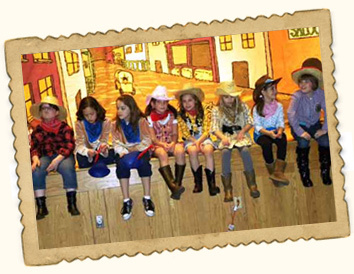 THEATERWEEK has been such a success that schools continue to bring us back year after year as an annual treat for their students. Many of our schools have been with us over 5, 10, 15 even 20 or more years; providing an amazing tradition for their students! Read our “Rave Reviews” and see why. A written summary of the production and cast of characters if needed for the Playbill. Playbill covers are also supplied. Our schedule books 1 to 2 years out with prime weeks going fast every year so call TODAY to reserve your school or organization’s week! Why not join us and observe a THEATERWEEK performance for yourself and see how it works? Just give us a call and we’ll set it up. You'll see a great performance with our enthusiastic THEATERWEEK actors delighting the audience – you've got nothing to lose! 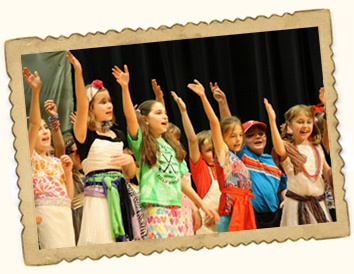 We'd love to brag some more about how our THEATERWEEK program builds children's self-esteem and confidence! Give us a call, write us an email or complete the form on our “Contact Us” page – we'll be happy to tell you more. We even have a dedicated Facebook page where we post THEATERWEEK announcements, pictures and accomplishments of the week's participants. 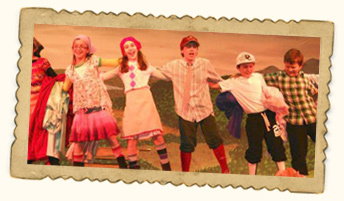 “LIKE US” so you won't miss out on any THEATERWEEK updates, www.facebook.com/theaterweek. 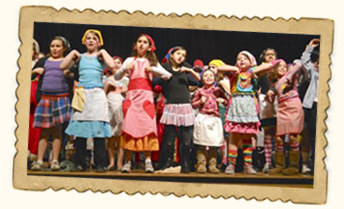 We have other unique fundraising opportunities for PTAs, PTOs, HSAs and school drama programs to present one of our professional touring shows with ticket sales directly benefitting their school. We can also conduct theater lectures or demonstration in your school. Call us today for more information. And if you have additional ideas we would love to brainstorm ways Taubenslag Productions can help you educate children in theater arts or raise money for your school – so give us a call. “Since last year’s play I had intentions to thank you for sharing your theatrical talents with the students. 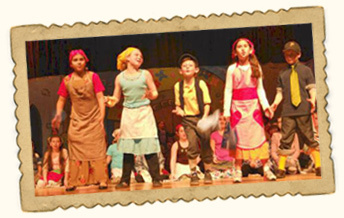 My daughter has enjoyed performing in your school productions since the 1st grade at James Madison. Last year she played the role of Granny in the play. Your productions are wonderful. 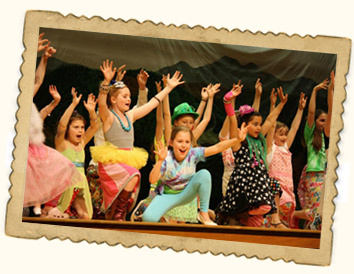 Giving each child an opportunity to experience stage performance is a great source to aid in the self-esteem, confidence, teamwork and group development. Thank you for making it possible for her to play Rose in this year’s Beauty and the Beast play. Your company will be missed next year as she attends Middle School at John Adams. “My granddaughter in in 3rd grade and my grandson is in 1st grade. Last night they were both in the “Silly Adventures of Sinbad”. It was her second show since she was in last year’s “Brave Little Tailors”. Although my grandson wasn’t sure he wanted to participate, he played a pirate and had a wonderful time. 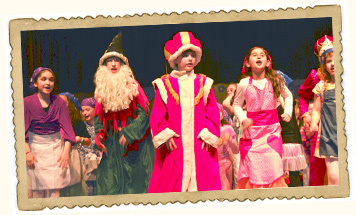 I am just writing to commend the school for having these productions each year. The children LOVE them and speaking for the audience, I love them too. For the amount of time they have to prepare, the shows are just so much fun and really put such a good message across – try your best and you can do anything. It is a wonderful tradition to have each year. Please keep doing so.